This refill for F'lint Retractable Lint Roller comes with set of 2 refills with 30 sheets in each. Just pull off the empty roller & cap, push on new refill until it snaps.The refillable sheets stay sticky until the next time you need them. Dimensions: 1.1" x 1.1" x 3.6"
This is so roller/refill is so convenient because it retracts into its holder. Easy to take anywhere. This lint roller stays in my car to combat cat hair. Works perfectly! Functional and good to have on hand with the lint roller. 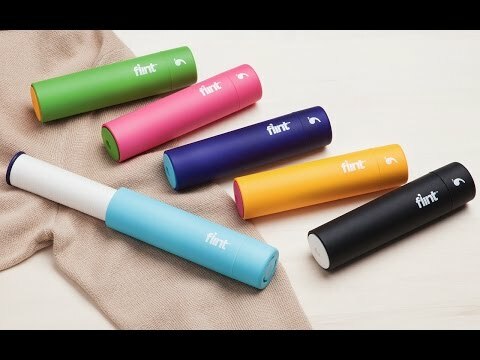 F’lint is a retractable lint roller with a modern, colorful design. It’s compact enough for travel or to simply stash in your everyday bag. In fact, this all-in-one roller and case is so sleek and minimal, you might not even know what it is at first glance. 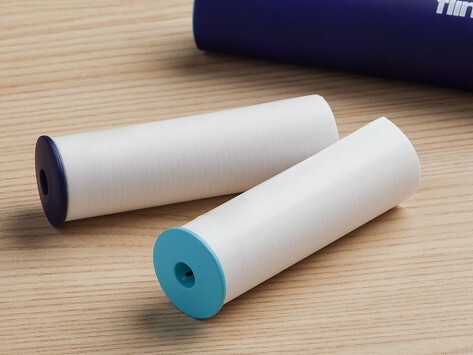 Founder Daniel Woolman solved the issue of lint rollers that are too bulky for travel, sheets that dry out, and that often get tossed out instead of refilled. With F’lint, twist the base to reveal the retractable roller, then pop it back in when you’re done. The sticky sheets are protected inside the case so all of that lint-grabbing goodness stays sticky until the next time. When you run out of sheets, it’s easy to refill F’lint, too. This handy little roller makes it easy to look neat wherever you are.